This chew resistant leash doubles as a tie-out! ProGuard durable cable leads are clearly the superior alternative to nylon mesh leads that fray and wear. Constructed of a flexible steel core coated with super strong lightweight PVC. These leads are also waterproof. 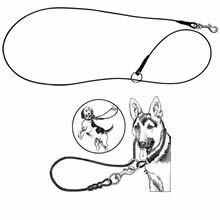 Perfect for overly aggressive pets, even if their weight is 40 lbs or more.Size 6 foot length.